Pastry chefs and bakers alike know puff pastry as the amazingly light, buttery and flaky dough used for sweet or savory applications like Jalousie, Pithivier, Chausson Pommes, Turnovers and Napoleon Slices. The concept is simple: hundreds of layers of dough and fat are created through the process of lamination. During baking, water content from the fat turns to steam and pushes up the many layers of dough creating an airy lightened structure. 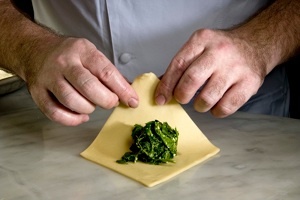 The fat is then absorbed into the layers of dough and poaches them, leading to the crisp texture and an increased stability of the light structure. Puff pastry can be made in several styles: classic, blitz (quick), Italian and inverted. Each of these dough will yield different results yet they can all be used interchangeably. Of the selection of puff pastry, inverted puff is the least like any other because the fat is on the outside of the dough. This key detail often intimidates some but may intrigue others. Either way, the use of inverted puff pastry has several advantages and is easy as long as a few key points are followed. The ingredient selection of inverted puff pastry is identical to those of classic and blitz buff pastry. The détrempe, or base dough, contains bread flour, water, salt, butter and optionally lemon juice and diastatic malt. The difference in the composition of the dough is based on the ratio of ingredients. A low-protein bread flour (11-12%) should be chosen for its balance of extensibility and elasticity. Due to the short mixing time and low hydration (43% based on flour weight) there is minimal development of gluten. Salt contributes flavor to the dough and also helps bind the water to the flour. Inverted puff pastry has more butter in the détrempe than classic puff pastry, which helps with extensibility and depth of flavor. The best puff pastry is made with only butter. Butter with a fat content of 80% will yield exceptional results, however for a different flavor dimension one could use European style butter. Lemon juice or vinegar is sometimes added to non-fermented pastry dough to help prevent oxidation and to help increase extensibility. Malt can be added to promote browning, however the same weight of sugar can be substituted for this function with good results. Mixing the détrempe for inverted puff pastry is limited to good ingredient incorporation. All of the ingredients are simply mixed together on slow speed for 3-4 minutes using the dough hook. In order to prevent over-mixing the dough, the butter that goes in the dough should be soft and pliable. Once the détrempe is mixed, it needs time to “relax” under refrigeration. Form the dough into a square shape about a 1” thick and cover it to the surface with plastic wrap. A minimum of one hour in the refrigerator is suggested, however it can cool overnight. A properly mixed détrempe for inverted puff pastry will be firm yet extensible and pliable. After the détrempe is mixed, the beurrage, or roll-in fat can be mixed. For inverted puff pastry, the beurrage is composed of butter and flour. The flour absorbs water content from the butter and makes the fat more pliable and resistant to softening during lamination. To prepare the beurrage, simply mix the fat and flour for lamination until they are evenly blended. Once mixed, spread the fat into an even thickness on a thick plastic sheet or silicone baking mat to twice the size of the détrempe. Reserve in the refrigerator until cold and ready to use. In the case of inverted puff pastry, the détrempe is enclosed in the beurrage. The beurrage should be twice the size of the détrempe so that it can easily wrap around it. The beurrage may need to be softened slightly in order to wrap it around the détrempe and ensure that it is extensible during sheeting. Once this step is complete, we have the paton (see below). By using sufficient dusting flour, the paton will not be too sticky. If the outside of the paton becomes too soft, place it in the refrigerator for a few minutes. The timing of the first few folds of inverted puff pastry is important. Before beginning the lamination process, the proper temperature and texture of the paton must be achieved to ensure ease of production. The butter in the beurrage needs to be cold, yet pliable. If it is too cold it will crack during lamination and if it is too soft it will absorb into the dough and be difficult to roll out evenly. 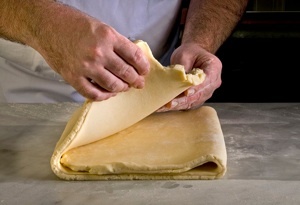 The process for lamination is the same as for classic puff pastry. 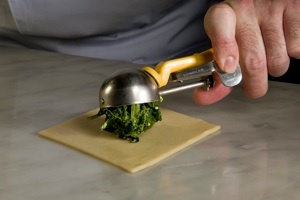 Five to six single folds is standard and two folds can be done back to back when using a dough sheeter (see below). Like classic or blitz puff, inverted puff should be kept cold in the refrigerator between sets of folds. Thirty minutes after the final fold, the dough can be sheeted for use. 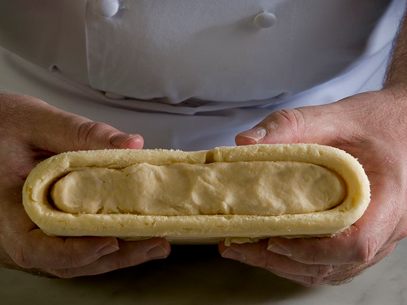 All puff pastry is sheeted to about 2mm thickness to ensure thin layers of dough and fat. If the dough layers are too thick, the butter will not be able to fully penetrate them and the puff pastry will be tough and the butter may leak out during the bake. Once sheeted out, relax the dough and cut as needed. If the dough becomes to soft, refrigerate the cut dough pieces until they are easier to handle. After make-up, it is important to reserve the pastry in the refrigerator for at least thirty minutes before baking to avoid mis-shaped pastry after baking. When one has knowledge of the ingredients and the process, inverted puff pastry is easier to work with than classic puff and may provide better results. Inverted puff does not become as sticky or soft as classic puff pastry during the final sheeting and make-up. Additionally, inverted puff pastry shrinks less during baking and has better storage properties in the freezer. Considering these benefits, inverted puff pastry can aid in the production of all puff pastry items allowing for easier handling and make-up and improved inventory quality in the freezer. Having fresh baked puff pastries that are light, buttery, flaky and all natural has never been so easy and so good. •Mix all ingredients (except for the butter and flour for beurrage) to incorporation only. •Form the dough into a flat square, place on a sheet pan and cover in plastic. •Reserve the dough in the refrigerator for at least one hour. •In a mixer with the paddle attachment, blend the butter and flour for beurrage together. •Spread the butter flour mixture into the form of a rectangle, twice the size of the dough. Reserve in the refrigerator. •Place the dough in the center of the butter and close the beurrage around the dough. •Give the dough 2 single folds and relax the dough for at least thirty minutes in the refrigerator. •Complete the previous step two more times for a total of six single folds. •Clean the spinach and dry well. •In a mixer filled with the paddle, blend the spinach and then add the feta cheese. •Reserve in the refrigerator until needed. 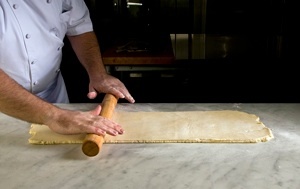 •Sheet the dough to a final width of 18.5” and down to 2 mm. •Cut the dough into 4.5” squares and rest in the refrigerator for at least 30 minutes. •Roll out the dough in one direction (rolling towards opposing points of the square) to make a diamond shape. 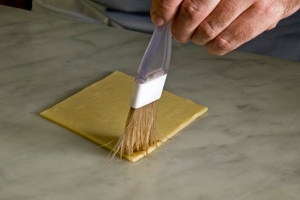 •Lightly brush the two front edges of the diamond shape with egg white. 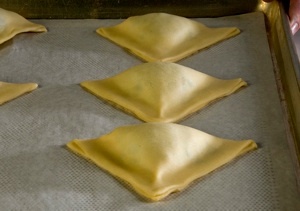 •Deposit the filling on the front 1/3rd of the pastry and fold the back portion of the dough piece to the front. •Next, seal the edges and ensure there are no air pockets. •Crimp the edges of the pastry, score the top of the turnover and create a steam vent. 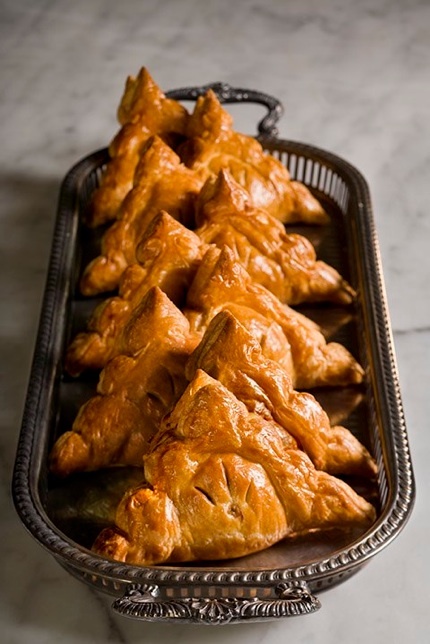 •Reserve the turnovers at least 4 hours in the refrigerator or freeze for later use. •Bake at 350° F convection for approximately 25 – 30 minutes or until golden brown on the sides.